Procedure: To understand convergent rays and divergent rays from mirror, we need to take a small piece of rubber foam and draw a straight line. Put the pins along the line drawn, and appears as straight lines coming out from the foam, now bend the piece of rubber foam inwards, and then we can observe that the pins meet at a point, and now bend the rubber foam, outwards then the pins appear that they are moving away from each other. Conclusions: Convergent rays meet to a point and divergent rays move away from each other. The experiment also help us to understand the concept of normals to the curved surfaces, in the first case, the pins act as normals to the concave mirror and in the second case, the pins move away from a point. The distance between converged or diverged point to surface is called Radius of curvature and the line is called normal. 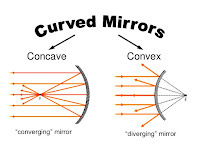 AIM: To find the focal length of a given concave mirror. Procedure: Collect the required materials from your laboratory, take V-stand and place the concave mirror in V-Stand, and to find the focal length of the concave mirror, we can use sun or tree or a person at a distance can be chosen as an object. If you suppose sun as the object, then face the reflecting surface towards sun, and observe the clear image of the sun as a smallest bright spot on the screen or white paper, if you suppose tree as an object, then face the reflecting surface of the mirror towards the tree and observe an inverted image of the tree on the screen or a white paper. The distance from the image to the pole of the mirror is known as focal length of the mirror. This distance is the distance between image and mirror as observed practically. We can observe the variation in size of the image when we move the screen towards or away from the Focus. Precautions: Measure the distance accurately, look at the size of the screen or white paper which should not obstruct incoming sun rays. Collect apparatus or materials required from laboratory, place the convex lens in v-stand, and place the screen on one side of the lens, and allow the light rays coming from distant object such as a tree. Adjust the distance from the screen to the lens such that the image of the tree should be clear. 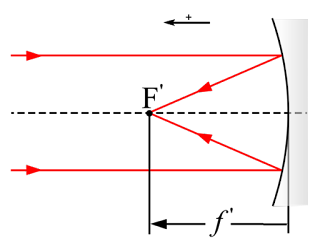 The distance from the image to the optic center of the lens is called the focal length of the lens. Precautions: screen, lens should be on the same line. Focal length can be also called as minimum limiting object distance. Before doing the experiment, find out the focal length of the given convex lens using distant object method, and note down the value. Use the same lens and place in a lens holder. Place a black stone at the bottom in glass tumbler which is filled with water. Now slowly, place the lens holder with lens into the water, to see the clear image of the black stone. The distance from the black stone to the lens will become the focal length of the lens. Precautions: Place the lens holder slowly into the water, the length of the tumbler should be at least 5 times than that of the focal length of the lens. We observe that the focal length of the convex lens is increased when it is placed in water. We understand that the focal length depends on surrounding medium of the lens also. To identify the least distance of distinct vision of eye, read a text book or news paper, at certain distance from your eye. Now you are able to read the contents from the book or paper, now you try to move the book or paper towards your eye till the contents are unable to read by you. Then you try to increase the distance from your eyes till you get clear/clarity of the letters. Ask your friend to measure the distance between your eyes and the book, this distance will be the least distance of the distinct vision of your eyes. Check the distance frequently, you can understand that whether there is any eye defect or not. Hold the book properly, measure the distances accurately. Least distance of distinct vision can be varied with age. Procedure .....The splitting of white light ray into its constituent colours is known as dispersion. To do this activity, take a prism and white light source and allow the white light to pass through the prism, then we get seven colours called VIBGYOR. Precautions: To get a narrow beam of light, white light should be allowed to pass through a small hole of paper or wooden plank. Observations: When white light passes through a prism, dispersion takes place and refraction can be observed. The angle of deviation is different for different colours. Violet is deviated maximum and red is deviated least. How to balance a chemical equation? A chemical equation tells us the type of reaction between different reactants. Chemical equation gives the states of the reactants and products. One can calculate the amount of products required for required amount of products. To balance a chemical equation, very interesting method is algebraic expression method. step 6) we conclude that the equation is said to be balanced. Prof. Stephen william Hawking was born on 8th Jan. 1942, in Oxford, England. Stephen studied at St. Albans School. Stephen was awarded Ph.D. titled "properties of Expanding Universe" in 1965. Stephen William Hawking was an English theoretical Physicist and Cosmlogist. This is the black body radiation which is supposed to be released by blackholes due to Quantum effects. This leads to black hole evaporation, the meaning is, Hawking radiation reduces the mass and energy of blackholes. 1. The Adams Prize: The prize is named after the mathematician "John Conch Adams"
2. Eddington Medal: Royal Astronomical society awards the Eddington Medal. "A Briefer history of time" a famous book written by Stephen Hawking. A Briefer history of time books gives explanation on all the forces of physics. Another book - "The Universe in a Nutshell". Stephen is a fellow of the Royal society and he is a member of the US National academy of Science. A transparent medium bounded by two surfaces, at least one of the surface should be a curved, is said to be a lens and it is said to be THIN LENS, When there is a small gap between the two surfaces or lenses where the thickness are much less and considered negligible in comparison to the radius of curvature. - the lens should be thin to consider above formula and the medium is same on either side of the lens. 1. An object is placed at 8 cm from a lens of focal length 15 cm, then calculate the image distance and determine whether the image is real or virtual. 2. A student using a lens of focal length -15cm, and object is placed at 20 cm from it, then calculate how far the image is from the lens and find out the magnification. Conclude whether the image is real or virtual. 3. Calculate the image distance and determine whether the image is real or virtual when an object is placed at 20 cm, from a lens of negative focal length -10cm. Refraction of light at curved surfaces - do you know? Refraction of light at curved surfaces.....do you know? How do you differentiate lens and spherical mirror? Differentiate focal length and Focus? Whether pole and optic centre denote same or different? Differentiate centre of curvature and Radius of curvature? Can you Identify different types of lenses? What do you term the effective width of a lens through which refraction takes place? When do you say an image is magnified or enlarged? 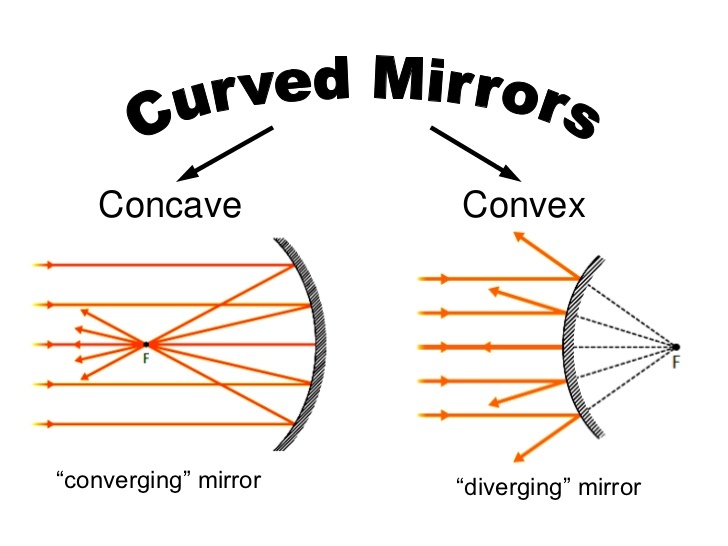 Can you draw ray diagrams for convex and concave lenses?